When trying to access a protected resource, the server (the security check) sends back to the client a list containing one or more challenges for the client to handle. The client must then register a challenge handler for each security check. The challenge handler defines the client-side behavior that is specific to the security check. A challenge handler is a class that handles challenges sent by the MobileFirst Server, such as displaying a login screen, collecting credentials, and submitting them back to the security check. In this example, the security check is PinCodeAttempts, which was defined in Implementing the CredentialsValidationSecurityCheck. The challenge sent by this security check contains the number of remaining attempts to log in (remainingAttempts), and an optional errorMsg. The minimum requirement from the SecurityCheckChallengeHandler protocol is to implement the handleChallenge method, which prompts the user to provide the credentials. The handleChallenge method receives the challenge JSON as a Dictionary. errorMsg = "This data requires a PIN code." The implementation of showPopup is included in the sample application. If the credentials are incorrect, you can expect the framework to call handleChallenge again. In some cases, such as clicking a Cancel button in the UI, you want to tell the framework to discard this challenge completely. Some scenarios may trigger a failure (such as maximum attempts reached). To handle these, implement the SecurityCheckChallengeHandler’s handleFailure method. The structure of the Dictionary passed as a parameter greatly depends on the nature of the failure. The implementation of showError is included in the sample application. In general, successes are automatically processed by the framework to allow the rest of the application to continue. Optionally, you can also choose to do something before the framework closes the challenge handler flow, by implementing the SecurityCheckChallengeHandler’s handleSuccess(success: [NSObject : AnyObject]!) method. Here again, the content and structure of the success Dictionary depends on what the security check sends. In the PinCodeAttemptsSwift sample application, the success does not contain any additional data and so handleSuccess is not implemented. For the challenge handler to listen for the right challenges, you must tell the framework to associate the challenge handler with a specific security check name. Note: Registering the challenge handler should only happen once in the entire application lifecycle. It is recommended to use the iOS AppDelegate class to do it. 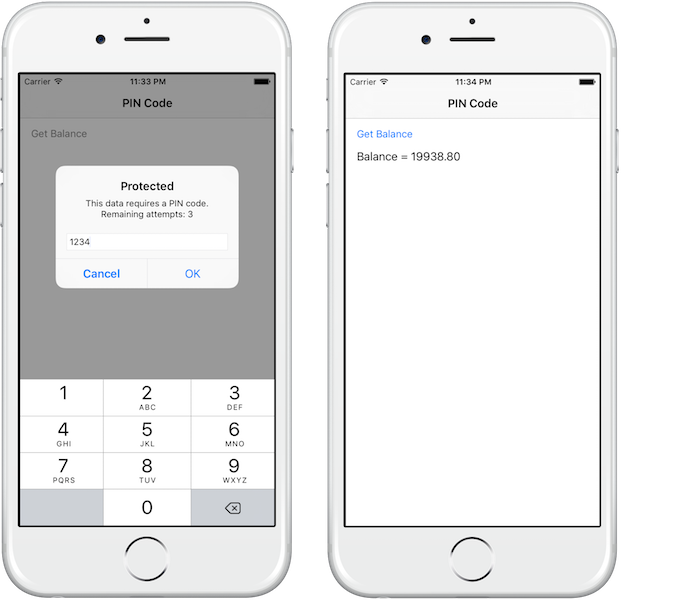 The sample PinCodeSwift is an iOS Swift application that uses WLResourceRequest to get a bank balance. The method is protected with a PIN code, with a maximum of 3 attempts. Click to download the SecurityAdapters Maven project. Click to download the iOS Swift Native project.